The Signature Life Assurance Car Handle lets you travel in your car with confidence knowing that you will have the support you need to get in and out of your car. 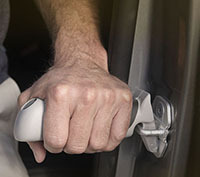 The Car Handle slides into the striker of most any car door and places the handle right where you need it for maximum support to get out of the car. Features of this handy device include a non-slip grip, a long lasting LED flashlight that provides extra visibility at night, a concealed key compartment for your spare key, and its light weight of only 1 lb but the capacity of supporting 350 lbs. The Assurance Car Handle measures 5 inches in length and 2 inches in width and will fit easily in the glove compartment of your car. The tip of the handle can also be used as an ice scraper. The Signature Life Assurance Car Handle has so possible uses in your car which makes it a must for any driver. As with the other Signature Life products, the car handle is listed without a price because we can only sell it in our store in Willow Street, PA. We cannot sell it online, so please do not put this product in your shopping cart.